“You Didn’t Build That”–Oh Yes I Did! Conservatives have seized upon a line in Barak Obama’s July 13th (2012) speech and made it a touchstone for conservative ideals. Obama’s “You didn’t build that” is answered with, “Yes I did.” Liberals retort that the quote is taken out of context and misinterpreted. This quote is critically important since its use could potentially sway enough swing voters to generate a republican victory in November. A bit of context and commentary might show whether conservatives have treated this quote fairly or not. Below is the entire quote in its relevant context, with interspersed commentary. Barak Obama: There are a lot of wealthy, successful Americans who agree with me — because they want to give something back. They know they didn’t — look, if you’ve been successful, you didn’t get there on your own. You didn’t get there on your own. I’m always struck by people who think, well, it must be because I was just so smart. There are a lot of smart people out there. It must be because I worked harder than everybody else. Let me tell you something — there are a whole bunch of hardworking people out there. . . . The president has slipped his reference point from the “hardest worker” to “hard worker.” It can be admittedly that hard work does not guarantee success, and, especially in this economy, a lot of hard workers cannot keep their jobs or advance. But that is not as much the case for the hardest workers. It is literally impossible for everyone to work harder than everyone else. The person who works harder than his peers is largely preferred over the less hard worker. Such a person is more valuable to his employer, is more likely to keep his job, and more likely to be promoted than his peers. A “little hard work” is not the point at issue. Rather, the entrepreneur, for example, is invariably the hardest worker within his business. And his “hardest” work is a big part in success. The entrepreneur works the hardest because he has to. He innovates, and stays late, and digs deep, and cuts expenses because if he doesn’t succeed he is wrecked more than anyone else. He builds it because no one else will. If the hardest worker is an employee, he still distinguishes himself and earns his place and may be the boss one day in large part because he was the hardest worker. The person who works the hardest is a little safer and has a better chance of advancing than the person who just “works hard.” The same can be said of the “smartest” worker, and more so about the person who combines smarts and hard work to earn do a better job than his peers.
. . . If you were successful, somebody along the line gave you some help. . . . Since this is more likely to have been private citizens, acting in a private capacity, the “government-help” connection that Obama is implying does not follow. If we suppose that Obama is not implying anything about government help then his point is trivial. Of course family, friends, and community help each individual to reach their level of success. But that help does not necessarily build anyone’s business. The individual still builds his business. They helped him/her become able to build, but they didn’t build it; the individual entrepreneur, the indidivudal farmer, the restaurateur, these are the people who build it. . . . . There was a great teacher somewhere in your life. Somebody helped to create this unbelievable American system that we have that allowed you to thrive. Somebody invested in roads and bridges. . . .
Perhaps the most offensive word here is “allowed.” Read strongly, this suggests that the collective “American System” is what possesses and doles out businesses to entrepreneurs. It is the collective system, the “we” that gives the entrepreneur permission to start his business. Since Obama likely understands government as part of that “American System,” this strong-reading sounds a lot like a Nanny State. Presumably, that implies that people owe some great gratitude and service (perhaps servitude) to their government for its great generosity of allowing them to have a business. That is a “strong-reading.” But it can be read more charitably too. By this “soft-reading,” the word “allowed,” is an open term for some broad preconditions which made the individuals success possible. The line would thus say, “Somebody helped to create this unbelievable American system that we have that [was sufficient to enable] you to thrive.” While this charitable reading is possible, I do not think Obama meant this. The thrust of his speech is towards some sense of indebtedness towards the collective help and support of others. He is rebutting the idea that individual citizens have built their own business pretty much on their own efforts. That entrepreneur, according to Obama, did not just receive help in building his business. He is indebted to those who helped him. Therefore, I think, Obama intends this strong sense of “allowed.” The collective American system is a/the rightful claimant of businesses, and it has granted individual entrepreneurs the permission to steward those businesses. Moreover, Obama has mentioned some interesting examples of collective initiative in citing roads and bridges. The roads and bridges were funded by tax dollars, from individual citizens, with private interests, many of which would be just as willing to use non-government means to build those roads if the government allowed them too—it follows then that we the people built those roads. Government “help” is largely indirect and often done in an overblown, inefficient, and mismanaged way compared to free-market private sector answers where people are spending their own money. Interstate roads, and much infrastructure does require wide-scale cooperation and support, but that does not reach the heart of the issue. No amount of roads or rails directly builds my business. Then are preconditions for it, but they do not do the actual work of building anything. If you’ve got a business — you didn’t build that. Somebody else made that happen. The Internet didn’t get invented on its own. Government research created the Internet so that all the companies could make money off the Internet. Here the President gives his infamous quote. He could have said, “You didn’t build that yourself,” or “You aren’t the only one who built that.” These variations are a little less offensive, but they still fail to solve the key problem of this speech and they aren’t what President Obama said anyway. Instead, he says more strongly “You didn’t build that.” This point is patently false. Even if other people helped build my business, I still built it, I just didn’t build it alone. Someone may object that the President was referring to something other than businesses. But the word “that” is singular. Since its most immediate object in the preceding phrase is “business,” then he is likely saying, “You didn’t build that [business].” If he meant those other elements mentioned earlier, like “roads,” bridges,” etc. then he should have said, “those.” He seems to mean the other people who helped individuals along the way—they are the ones who built this. Taken one way, this line is self-refuting. A better interpretation is possible but let’s first see how that line can defeat itself. If nobody built anything, and others have actually done it for them, then neither did those other people build their respective “roads, bridges, teaching, etc.” In short, the ad infinitum ad absurdum conclusion follows that no one built anything, but neither did the other people who helped them, neither did they build anything since they had people who helped them, and so on and so on. No one built anything. I don’t think this reading is necessary. There is a gentler way to read Obama’s infamous line. Perhaps “you” (singular) did not build that, but “we” did. We all have some kind of help and this is easily admitted. I’ll assume this gentler reading is what Obama meant. Still, this line “You didn’t build that,” is patently false. If Joe Plumber builds his plumbing business then he has to have help from all sorts of things that aren’t really “building” his business. He needs police to help in case a customer assaults him and steals his wallet. He needs water to exist and have the properties of water or else he can’t be a plumber. He needs the senate and house to establish laws and the court system to enforce laws of the land so Tyrants don’t collect all the power and run the country into the ground ruining his plumbing business. Keeping the “building” analogy, all of these contributing factors provide the individual citizen with the building tools—the bricks of technology and culture, the mortar of family and community, the tool belt of education, the cement of constitutional law, and so on. But none of that builds my business! The individual must take the initiative to collect those resources then sweat and bleed over them till that business is built. Obama’s line is therefore patently false for treating the brute materials of society like they somehow construct themselves without private citizens infusing the critical factor of actually building the business. No amount of other people’s help ever builds our businesses. Obama’s commentary here is only trivially true. We can all admit that we are contingent, interdependent beings, who did not give birth to ourselves, feed ourselves as infants, sew all our own clothes, mill our own flour, etc. etc. So what? Many many things require outside help. And more towards Obama’s line of thought, many things require government help such as fire-fighting, policing, and military efforts. Obama’s example is not helpfully related to individual entrepreneurship unless perhaps we are talking about Bounty Hunters or Private Military Contractors. So we say to ourselves, ever since the founding of this country, you know what, there are some things we do better together. That’s how we funded the G.I. Bill. That’s how we created the middle class. That’s how we built the Golden Gate Bridge or the Hoover Dam. That’s how we invented the Internet. That’s how we sent a man to the moon. We rise or fall together as one nation and as one people, and that’s the reason I’m running for President — because I still believe in that idea. You’re not on your own, we’re in this together. This point would be more penetrating if he retained a private business context, and distinguish between “allowing” (passive) and “building” (active) business. The government does not and should not build my business. That is what China does by limiting and directing people’s career options regardless of what the individuals themselves would prefer to do. Instead, the Government should help clear the field of lawlessness gross injustice and monopolistic imbalance (including government monopolies) and establish a wide perimeter fence to protect against foreign (military) threats so as to allow cement of constitutional idealism to set. The government has not built my business, but rather has built a large perimeter fence so that there is a free and wide field for me to build my own business, how I want it, to serve my interests, and meet the needs I intend to meet. So, sure, we are in this together and we can help each other. But no one else builds my business, just as no one else has to take the fall when my business fails, and no one else writes the checks for my business investments. 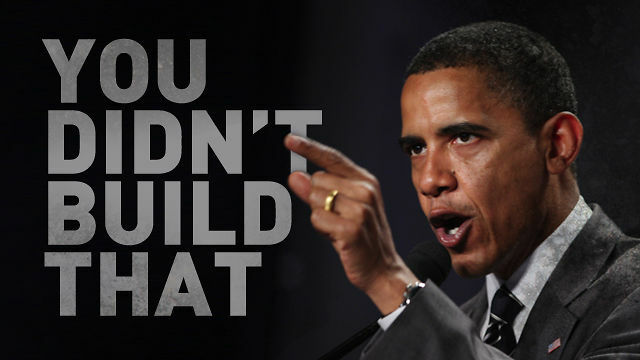 In conclusion, Barak Obama’s now infamous quote, “You didn’t build that,” is well understand by his opponents. The general reading of it at the Republican National Convention is fair. The critical distinction seems to be between “allowing” a business and “building” a business. People can help, and people can get out of the way, and the government can certainly support or oppose individual business, but it is invariably the entrepreneur who is actually building that business. (Barak Obama, Roanoke, VA: Speech, 13 July 2012, accessed July 26, 2012 at: http://radio.foxnews.com/2012/07/26/president-obamas-you-didnt-build-that-transcript/). ← Is the mind the same as the brain?